Thimbelina: A Sneak Peak and a Finish for Jo! Well I'm pleased to report that I managed to get the baby gift I started yesterday all finished...... and bub hasn't even arrived yet! I can't show you the whole thing yet, you never know who might be sticky-beaking on here, but I will give you a sneak peak. It's quite lairy compared to the things I usually make so now i'm panicking that she wont like it (but will feel obliged to use it)...... I often struggle to choose fabrics when making things for other people! While I was busy making my baby gift, my sewing partner for the day managed to get this whole quilt quilted and bound. Isn't it pretty?..... I know her Miss 7 is going to love it! 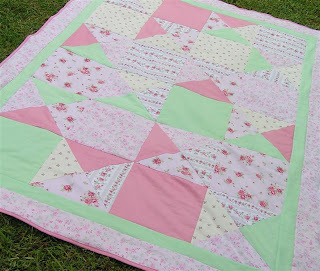 Can you believe she didn't think this lovely quilt was up to standard for my blog??? The pattern is called "Squares and Hourglass" and was from an old issue of Better Homes and Gardens.... fabric from Spotlight.